I think the only thing that I like more than Mexican food might be multitasking Mexican food. I’d never actually had a fish taco until I moved to Texas, as ironic as that sounds. Yes, I grew up on the East Coast right there next to the ocean practically and never had a fish taco. After giving them a try at a local restaurant here a few years ago, I fell in love and pretty much opt for the fish version when given a choice. Most times the fish is breaded and fried in the tacos which probably is why I like them so much. I decided to come up with a recipe to make these at home to save a few calories. The recipe took hardly any time at all to throw together so it’s perfect for making after a long day at work. You don’t end up dirtying a bunch of stuff either since you can use the same cookie sheet for the veggies and then the fish afterwards. The best part is the sauce. It makes a huge batch that you can drizzle on your tacos, but I had tons left to use as salad dressing. Multi-purpose sauce! I had enough to last me through 4 salads in addition to the tacos and leftover tacos. You could even use it to add a kick to sandwiches. I used the entire jalapeno in mine, but if you want a less spicy version you can use just half of the pepper. Turn on your broiler and line a cookie sheet with tin foil. Spread the garlic, tomatillo slices, and jalapeno on the sheet. Place under the broiler and broil for about 5 minutes until blackened on the edges. Remove from the oven. In a food processor or blender, combine the mayonnaise, sugar, cilantro stems, garlic, tomatillos, and jalapeno. I tossed everything in my Magic Bullet and it was the perfect size. Blend until smooth. Place the tilapia fillets on the foiled lined cookie sheet and broil for 2 – 3 minutes per side, flipping partway through to cook both sides. Remove from oven. Place a tortilla on each plate and add a fillet on top. Top each taco with 1/4 cup of the shredded cabbage, a drizzle of lime juice, and tomatillo sauce. Garnish with cilantro leaves, if desired. Makes 4 large stuffed tacos at approximately 239 calories each. You could easily do this recipe with steak, shrimp, or chicken instead. 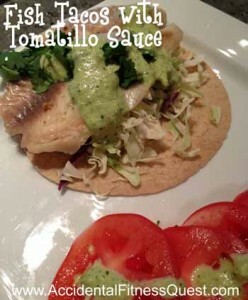 As you can see from the picture, I drizzled my tomatoes with the tomatillo sauce. That stuff is deadly good. If you’re interested in another use of tomatillos, here’s another recipe for you. What’s your favorite Mexican food? Have you tried fish tacos yet?